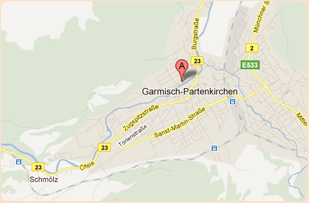 Our guesthouse Nicole lies only 3 minutes from the center of Garmisch and is nevertheless quietly located. Hiking trails and ski areas are nearby. Parking is available in front of the house. Comfortably furnished double- and triple rooms with stunning mountain view, full breakfast, bathroom (shower, toilet), balcony, cable TV (LCD) and WLAN connection welcome you in our owner-managed guesthouse. Our guest house offers rooms with modern facilities and comfortable beds. In Garmisch Partenkirchen you will find many ways that invite hiking and mountain tours. Garmisch Partenkirchen offers many attractions and destinations. A holiday in our guest house offers you the necessary relaxation to switch off from everyday life and stress. We look forward to seeing you in our beautiful guest house Nicole. How to find us.